Hunters Hill Young in Art Award winners were presented with thei prizes this week with the Secondary Section Prize won by Georgia Houlihan and the Primary Section won by Hunters Hill Public School. Georgia Houlihan is a student at Marist Sisters College in Woolwich and her work titled ‘Forbindelse’ was described by judges as an emotional and inspired portrayal of the female form. Scarlett Michaeli, Jessica Mancuso, Sonia Sciara, Roger Chen, Cameron Zirn, Eliane Steger, Angus Jamieson, Ciara Murphy, Ben Jones, Angelica Ruprecht and Candela Serra won the Highly Commended Awards in the Senior Section. 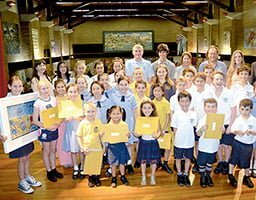 Highly Commended Awards in the Kindergarten and Primary Section were won by Jack Myers (Kindy), Amber Pavendranathan, Lachlan Gosbell, Holly Lewis, Andrew Thompson and Bronte Jackson. 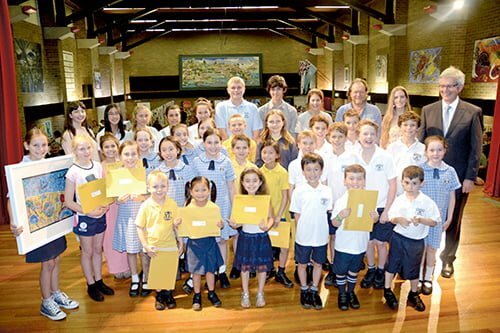 Young In Art Award winners are pictured (above). TWT on-the-spot PHOTO.